After languishing in storage for a quarter-century, colorful artwork from a historic Barrio Logan brewery will soon be uncrated and seen again. This is the second of a two-part series reported together with KPBS. Read the first piece here. Listen for companion radio stories on 89.5 FM or on kpbs.org. The bones of a San Diego legend lay in fragments on tables in a warehouse. The shards of paintings, chunks of wall, chandeliers, chairs and stained glass windows once constituted the popular tasting room of the old Aztec Brewing Co. in Barrio Logan in the ’30s and ’40s, but have been sequestered since the building’s demolition more than 20 years ago. That giant jigsaw puzzle in the warehouse five years ago was one of the only times anyone has seen the artwork in the decades it’s been in storage. Art appraiser Pamela Bensoussan went to assess the collection, and the vibrancy of the pieces blew her away. Some of the massive Aztec and Mayan murals by Spanish artist Jose Moya del Pino were in fragments, she said. But the pieces seemed like paintings on their own. But the pieces would go right back into their crates, out of sight yet again. Discovered in the late ’80s in a building about to be demolished, the artwork and furniture from the tasting room the brewery called the “rathskeller” inspired local artists and activists to fight for its survival. The city took ownership and has been storing them ever since, promising to one day reinstall them in the neighborhood. Soon, after more than 20 years, much of the artwork will again see the light of day, restoring a link in the vibrant neighborhood’s cultural history. The city plans to restore the artwork and install it in a restaurant in the long-awaited Mercado del Barrio project. But a lot is still up in the air — the Mercado’s developers have yet to find a restaurateur to move in to the space, and the artist who rediscovered the artwork to begin with cringes at the thought of installing it where people eat. The plan, though, marks the first feasible arrangement to exhume this slice of history after a quarter-century of delays. San Diegans may soon be able to again imbibe surrounded by the historically rich, colorful pieces. In the shadow of the freeways overhead, construction crews began in July building the Mercado del Barrio after more than 20 years of political struggle, fights over who owns the land and a slumping real estate market. Now the building’s shell and wooden bones are rising from the ground to soon house the neighborhood’s first major supermarket in decades and include shops and housing. The Aztec Brewing Co. artwork. The city and the developers are already negotiating the terms of the artwork’s loan, figuring out what will be required to protect the pieces in the restaurant from grease and humidity. Architectural renderings integrate murals, stained glass windows, ceiling beams, framed paintings, the tiled bar, doors and chandeliers. 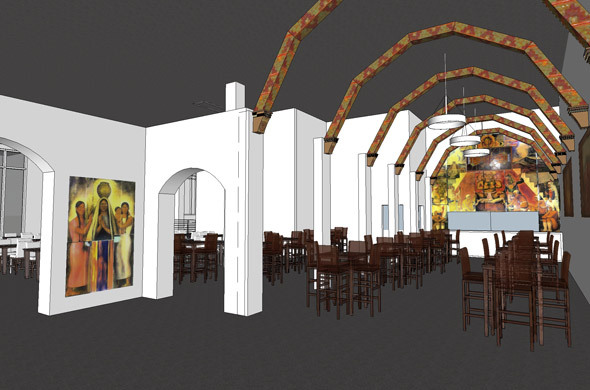 A rendering of a new restaurant in Mercado del Barrio with the rathskeller artwork installed, by Safdie Rabines Architects. The murals have a new home on paper, but nobody’s officially set to move into that home yet: The developers don’t yet know what restaurant will go in the Mercado. They’ve not publicly revealed any leads they’re working on, but the developers imagine the restaurant will be a regionally or locally owned spot. “Not like a Denny’s, or something like that,” said Kevin McCook, who oversees the development. They said they can’t imagine a restaurateur not finding the built-in artwork an extra draw. And as the negotiation with the city and potential restaurants continues, there’s still a chance the developers will find a different place in the Mercado besides the restaurant for the restored artwork to go, McCook said. Not every last piece of art and furniture from the old brewery will go in. When the city hired Bensoussan in 2007 to examine the collection in that warehouse, she determined the value of the pieces in the ensemble was greater than the sum of the parts. As-is, the collection was worth $205,000, she said. Fixed up and professionally restored, the value of the collection would jump to about $506,000. If the collection is not kept intact, the total market value for restored pieces, Bensoussan estimated, drops about 20 percent to $405,400. She said she prefers the ensemble be kept together, down to the otherwise valueless shards of plaster. Dana Springs, the city’s public art manager, said the city can’t do that. There’s not enough money — or space in the intended restaurant — to pull every last piece out of storage. Some pieces are in such disrepair it’s not worth fixing them, she said. City officials won a federal grant for more than $400,000 to pull pieces out and restore them to put in the Mercado project. That money will go to paying art professionals to restore and install the murals, doors, stained glass windows, chandeliers, paintings and ceiling beams. The objects the city has selected to fix up with the federal grant will likely be worth more than $350,000 when restored. Muralist Salvador Torres takes a break from painting to talk about discovering the rathskeller artwork back in 1988. Working on a nearby mural in paint-splattered overalls one recent morning, Salvador Torres sighed, remembering his original dream of a museum-like home for the brewery artworks. 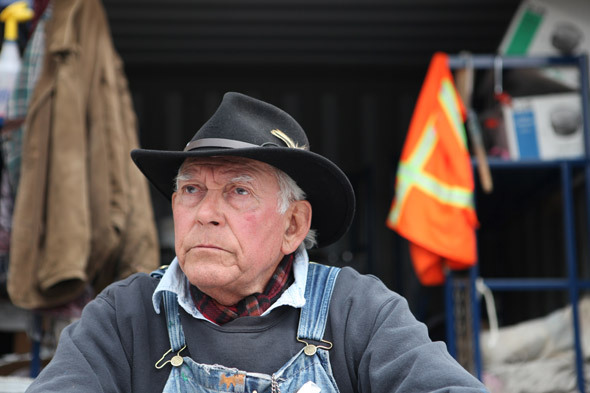 In his 70s now, Torres doesn’t like the idea of carving up the collection he spent so much time fighting to save. And he doesn’t like the proposed setting. Taking a break from painting, he read aloud from a poem he wrote to Moya del Pino in 1988. The people in Barrio Logan helped build the city, Torres said, his voice heavy with emotion. Torres’s friend, Rachael Ortiz, runs a community center in Barrio Logan. She said she understands his sentiment. But “it’s all rhetoric unless you attach some money to it,” she said. And she said the plans, to her, look beautiful. Springs said the work of public art means balancing the value of the artwork with its audience. If a greater cross-section of people will see these pieces in a restaurant, she said, then that’s what makes sense. Flipping through architects’ drawings with the rathskeller artwork sketched in to the restaurant, Ortiz said she can already taste the tequila. And the faces Moya del Pino painted into the rathskeller artworks will again keep watch. 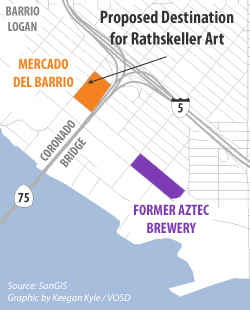 YESTERDAY: The rathskeller tasting room on Main Street in Barrio Logan was a destination decades before San Diego cemented its reputation as a craft-brew capital. Rediscovered days before a wrecking ball was due in the 1980s, the brewery’s noted artwork escaped demolition and has been sitting in storage ever since, waiting to realize the city’s promise to bring the pieces home someday. Kelly Bennett is a reporter for Voice of San Diego and Angela Carone is a reporter for KPBS. You can reach them directly at kelly.bennett@voiceofsandiego.org or acarone@kpbs.org.